God Is an Astronaut are an instrumental three piece hailing from the Glen of the Downs, Co. Wicklow, Ireland. They formed in 2002 and released their debut album The End of the Beginning (2002) on their own Revive Records label. Their two music videos for The End of the Beginning and From Dust to the Beyond, received airplay on MTV UK and on other MTV European networks. All Is Violent, All Is Bright (2005) is the band's second album. The album features their build ups from serene ambience to searing intensity and is a closer representation of their live sound. The single Fragile from the album has also received plays on MTV2 UK's 120 minute show and MTV's "The Comedown" show. 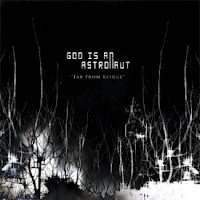 God Is an Astronaut released an EP called A Moment of Stillness in 2006. Their third album, Far from Refuge, was released in April 2007 on Revive Records and as a download via their website.